Hawick councillors Stuart Marshall and Watson McAteer in Langlands Road. Hope is at hand for Hawick householders fed up about recent delays to their bin collections. Residents in some parts of the town have faced waits of two to three weeks for their rubbish to be picked up. The places hardest hit include Langlands Road, the Wellogate area, Havelock Place and Duke Street, where flood defence works have been carried out. Parked cars making some streets inaccessible has been cited among the reasons for the delays. Hawick and Denholm councillors Watson McAteer and Stuart Marshall don’t blame the refuse collectors for the problems, but they want the council to keep residents better informed as issues arise. They are in talks with the council, with one solution to be explored being the possibility of downsizing vehicles to better negotiate narrow streets. And on Monday, they are preparing to get their hands dirty when they will join refuse collectors on one of their runs to see at first hand the problems they face. Mr Marshall said: “Judging by the amount of complaints that I have received lately from residents in Langlands Road, there appear to be very serious issues around the collection of their refuse. “Last week, I had a site visit with officials and, along with Councillor McAteer, we explored the possibilities of downsizing the vehicle currently used to negotiate these narrow streets. “This issue is not the fault of the refuse collectors themselves, and both Watson and I are meeting officials next week to see how best to resolve the matter. Mr McAteer added: “One explanation given is that bin lorries have not been able to access streets concerned. 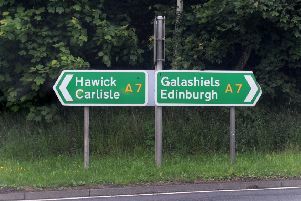 A Scottish Borders Council spokesperson said: “The waste service has a number of vehicle sizes operating across the area and aims to utilise these as efficiently as possible while working within operational constraints. “Negotiating tight streets is always a challenge when driving large vehicles, which is made more difficult with the increased number and size of cars and lack of parking spaces in some areas. Health and safety is of paramount importance, and trained HGV drivers will always use their discretion in situations where they feel there is any risk. “We endeavour to inform our customer services team as soon as possible when access to a street for refuse collection purposes has not been possible in order that householders can be updated.